Most mortgage rates we see advertised are for conforming mortgages, which for sake of simplicity, are good for loan amounts up to $729,750. 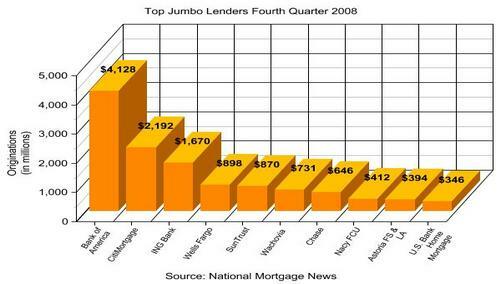 But what about those of us looking for larger loans, otherwise known as jumbo mortgages? Who’s offering them and at what price? Well, as I recently noted in an article, Return of the Jumbo, it looks as if this type of financing is making a bit of a comeback, after being largely non-existent over the past year and change. Leading the way is Bank of America, which plans to offer a loan program focused on loan amounts between $730,000 and $1.5 million, with 30-year mortgages beginning in the upper five-percent range. Sure that’s a percentage point higher than the conforming mortgages on offer, but you’ve gotta pay for that extra risk. Wells Fargo is offering a 30-year jumbo at 6.50 percent, compared to 4.75 percent for a comparable conforming loan. During the fourth quarter, Bank of America was the top jumbo mortgage lender with $4.1 billion in originations, followed distantly by CitiMortgage with $2.2 billion, and ING Bank with $1.7 billion, according to National Mortgage News Data. Wells Fargo and SunTrust Mortgage rounded out the top five with $898 million and $870 million, respectively. Bank of America has been fairly steady over the last year, but CitiMortgage and Wells Fargo reduced their jumbo lending by 68 percent and 86 percent since the fourth quarter of 2007. Only two lenders in the top ten increased their jumbo lending over the past year, including Navy Federal Credit Union, which saw originations more than double to $412 million, and U.S. Bank Mortgage, which increased lending 28 percent to $346 million.